Our custom-built photo booth combines the fun, vintage charm of a photo booth with state-of-the-art technology. Equipped with a touch screen and sold black background, it is a real booth that you can sit in, close the curtain, and have fun! 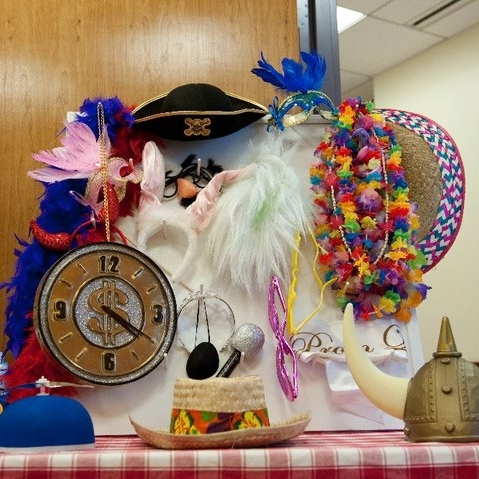 No photo booth is complete without props! Our props are high quality, clean, up-to-date and always free. We have everything from crazy hats, sparkling masks, and giant glasses, Looking for something more custom? We can help! Our photo lab-quality printer will have you holding your photos in seconds and ready to enjoy. Customize the design to match your wedding, party theme, company logo, or choose from one of our customizable on-trend designs. For other special events - proms, project graduation, reunions, church fairs, etc. please contact us for rates. upon request and are subject to an additional fee. Parrott's Photo Booth Co. is a family owned and operated business, founded in 2010 by David and Janet Parrott. David, an avid photographer and entrepreneur at heart, designed and built the booth with his family for his daughter's wedding. The following year he began renting the booth for weddings, class reunions, proms, project graduations, and church fairs. He loved providing the photo booth for these events and meeting new people. Janet and her daughters, Sarah and Jessica, continue to operate Parrott's Photo Booth Co. in the same spirit as David did for the last eight years - providing a unique photo booth experience and unforgettably good fun, capturing your life's best moments. We look forward to working with you! - Photo Booth dimensions - 78” long, 34” wide and 77” tall. - Interior compartment - 46-3/4” long and 30-3/4” wide. We have fit as many as 8 people in the booth! Tell us more about your event and we will be in touch with a quote!